A staggering 69 per cent of foreigners living in Phuket or visiting the island receive little to no warning about the dangers of dengue and how the disease is transmitted, according to the results of the latest online poll by The Phuket News. The recent bout of wet weather over Phuket has left puddles of fresh water strewn all over the island, the perfect breeding grounds for mosquitoes that carry the potentially lethal dengue virus. 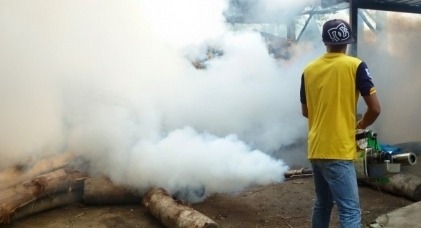 But the Phuket Provincial Health Office (PPHO) recently reported that the number of dengue cases at Phuket hospitals so far this year is “no more than normal”, as the return of the annual southwest monsoon also brings an annual spike in the incidence of dengue. The PPHO and local authorities weeks ago launched campaigns to raise awareness of the disease as they do every year, but the campaigns are in Thai and aimed at educating Thai-speaking residents. Testament to how little warning foreigners in Phuket receive about dengue, only 2pc of respondents to the poll said “Yes, foreigners are given ample warning about dengue” – and all those respondents were Thai. And of that 10pc of respondents to the poll, 12pc were “Foreign visitors to Phuket”, better known simply as tourists.